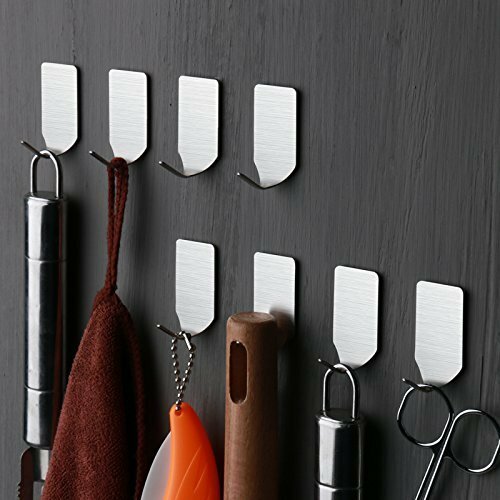 Home › Best-Sellers › Outowin 8 Pack Stainless Steel Brushed 3M Self Adhesive Mini Robe Hook Cloth ..
Outowin 8 Pack Stainless Steel Brushed 3M Self Adhesive Mini Robe Hook Cloth ..
One piece: No damage manufacturing processing and excellent drawing polishing technology; the hook is strong and durable. Each metal hook can hold up to 1kg. It's a necessary gadget for bathroom, kitchen, bedroom and so on. 3M adhesive: The hook is made up of the imported 3M adhesive, you have no need to worry about when it will be off glue. 3M adhesive is Widely used in the aerospace, medical, which is recognized as a good quality glue. It can achieve the best adhesion within 24 hours and is suitable for multiple walls. Such as: tile, glass, mosaic, template, natural stone, antique bricks. Waterproof design: No longer have to worry about the hook will fall off after suffering the water. Designed to hold a wide variety of items such as coats, hats, handbags, umbrellas, towels or robes, etc. DESIGN AND MATERIAL: Classical, Simple, Elegant and Popular Design; 304 Premium Grade Stainless Steel Robe Hooks Towel Coat Hooks Wall Hangers .